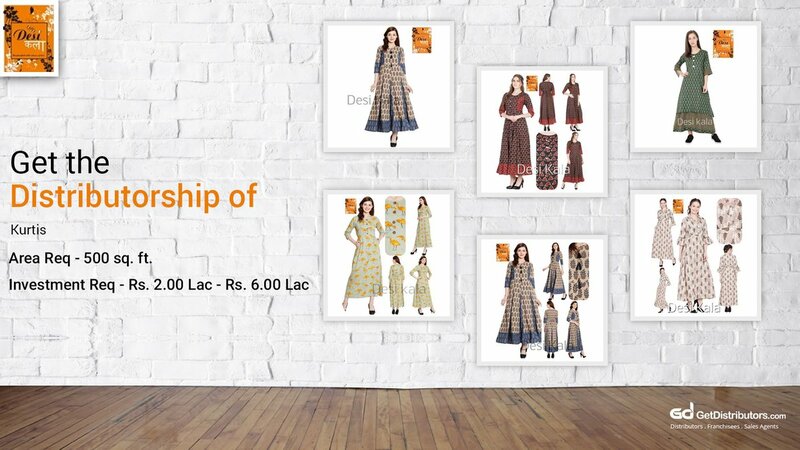 Established in the year 1990, we, DESI KALA, are engaged in manufacturing and supplying an array of Printed Cotton Kurti, Cotton Jacket Kurti, Cotton Long Kurti, Cotton Jaipuri Kurtis and more. Located at Delhi, India, we have with us some highly experienced and professional designers, who work hard to create unique designs and patterns. The apparels offered by us are widely demanded for their attractive design, impeccable finish, superb fittings, color fastness and smooth texture. With annual sales of Rs. 10.00 Lac – Rs. 20.00 Lac, we have proven our worth in the sector. To expand further, we are willing to get connected with city level distributors. Above mentioned list is not exhaustive. Our distributors will be provided promotional kit which includes brochures, banners, etc.